I made it home Tuesday from an extra long weekend in North Carolina where my best friend, Patti, lives. I can’t begin to tell you what a peaceful, calming, heavenly place the mountain is for me, but I can say I am one lucky duck that I have a home away from home on a big mountain where Mother Nature takes my breath away. While it was sleeting and cold back home, we were enjoying a lovely dinner at The Stable Restaurant before our tour of the Biltmore all decked out for Christmas. I love history, and think I could walk through the house a hundred times and enjoy it, but this was special. A children’s choir, in clear; beautiful voices sang Christmas carols and I lost count of the number of decorated trees!! The only thing about the trip that caused me a bit of anxiety was, well, getting there. I hadn’t been on a plane since 9/11 and spent several days prior to the trip freaking out about what I could and maybe couldn’t take. Piece of cake. Turns out when you talk to everyone like I do, they tend to give you help before you even ask. Well, except for the one time that I was waiting in Atlanta for my plane to take me to Memphis and they sent word out that they were changing flights and THAT plane was going to Omaha and I had to catch the doggone plane train again to get to another gate in three minutes or less! I’m thinking of trying out for the Olympics, because my soon to be 59 year old patootie ran like it had never run before! Next time I will tell you about the race car driver, athlete with a big honking ring, realtor from Phoenix and plane pilot I met on the planes. Oh, and the young lady at the waiting area that felt compelled to show me the tattoo on her back that she designed…. 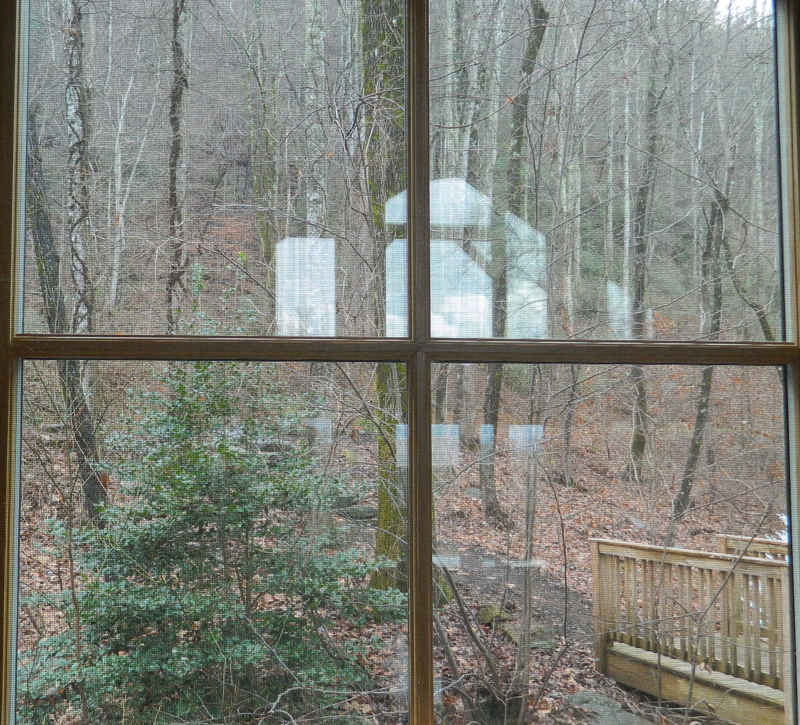 I took this picture while watching a woodpecker out the kitchen window because I thought it was neat the way the windows in the back appeared.